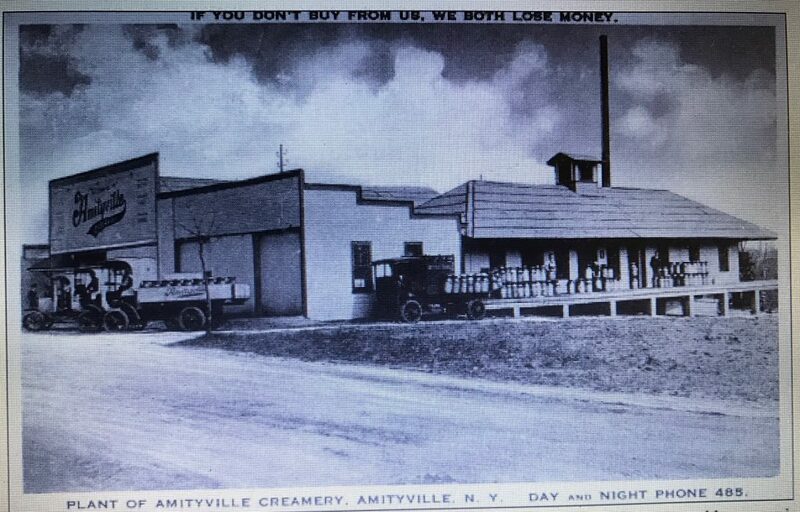 Amityville Creamery, Inc./Evans-Amityville, Amityville L. I. At least for a time, the business also maintained facilities in Freeport Long Island. The 1926 Freeport Directory lists them at two locations, 176 N Main and 37 S Grove. By 1930, the business is not listed in the Freeport Directory and another milk business, Fred Beers, Inc. is located at 176 N Main. At some point, the company merged with Evans Dairy of Rockville Centre becoming the Evans-Amityville Dairy. 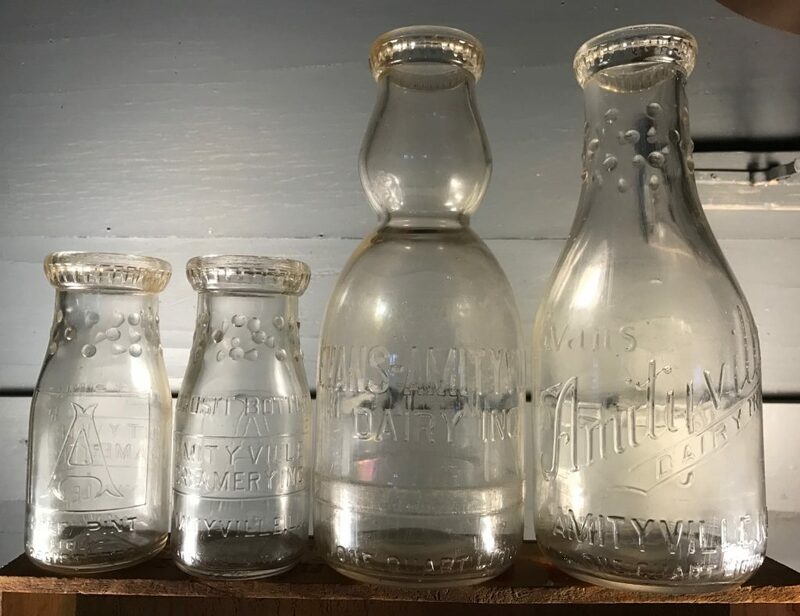 I’ve found an Amityville Creamery bottle with a 1939 Owens-Illinois Glass code and an Evans-Amityville bottle with a 1946 Owens-Illinois Glass code leading me to believe that the merger occurred sometime between 1939 and 1946; probably in the early 1940’s. According to various newspaper references the business also operated a distribution plant in Rockville Centre in the 1940’s and early 1950’s. The plant caught fire and burned to the ground on February 12, 1954. Willet H Evans, President of Evans Dairy Inc. of Amityville announced this week the acquisition of the former Stills Dairy of Medford. The ever-expanding dairy – termed the largest on Long Island – serves homes, hospitals, schools and stores from the Queens border to Montauk Point. The trade name was recently changed (from Evans-Amityville Dairy to Evans Dairy). They continued to use the Wellington Place address for most (at least through 1957) if not all of their history. The end of the business apparently came quickly. A 1971federal indictment charged that in the mid-1960’s Joseph P Fingst, at the time a Supreme Court Justice in NY, conspired with others to take control of the W M Evans Dairy Co. and the Evans-Amityville Dairy, Inc. The indictment went on to allege that the defendants sold off the dairy’s assets and pocketed the cash before causing the dairy to file for bankruptcy. The Wellington Avenue site is now occupied by a series of condominiums and Hartman Lake has been renamed Petchkin Park. I found two small half-pint bottles embossed Amityville Creamery Inc with the 1939 Owens-Illinois Glass code. They are also embossed with the patent no 1,650,440 and date of Nov 22, 1927. This patent applied for by Edward F Glacken related to the specific type of finish (that included embossed indentations) on the bottle. I also found two quart size Evans-Amityville bottles with Owens-Illinois Glass codes of 1946 and 1954. The 1954 bottle has a cream top. Next Next post: W. M. Evans Dairy Co., Inc., 3480 Fulton St., Brooklyn, N.Y.